It was once again time to take another furlough day, and time to plan another adventure. 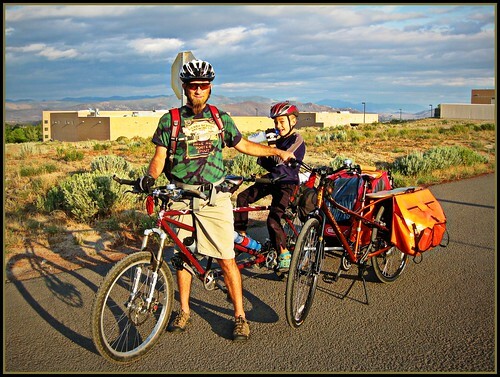 I’m currently reading Joe Kurmaskie’s book, Metal Cowboy, Tales from the Road Less Pedaled, a collection of essays about his bicycle travels around the world. Reading about his adventurous tales got me yearning for my own two-wheeled adventure. Not having time for an actual bicycle tour though, we decided to go for an overnight bicycle camping trip. I’ve been hearing a lot about Sub-24 Hour Overnight (S24O) camping trips, and figured we had enough gear to give it a go. 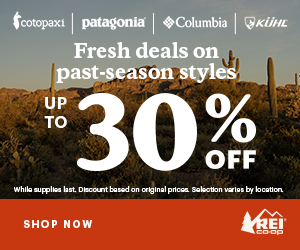 We have a big mix of camping gear, some of it light weight backpacking gear, and other stuff better suited for car camping. Since we weren’t going too far away for our first trip, I figured we could carry a surplus of stuff, and not suffer too badly. We could learn from our first trip what worked well, what could be changed, and what would be better left at home. 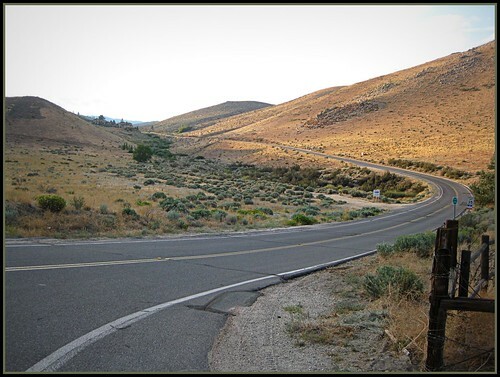 No matter which direction you pick, there is a substantial hill climb out of Carson City. We chose Washoe Lake State Park as our first destination. A steep climb to get there, but only 10 miles from home. 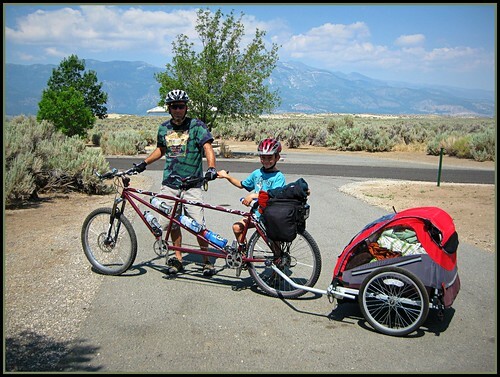 After my son got out of school, we loaded our camping gear aboard the Kona Ute utility bike, in the panniers on the tandem, and in a bicycle trailer attached to the rear of the tandem. 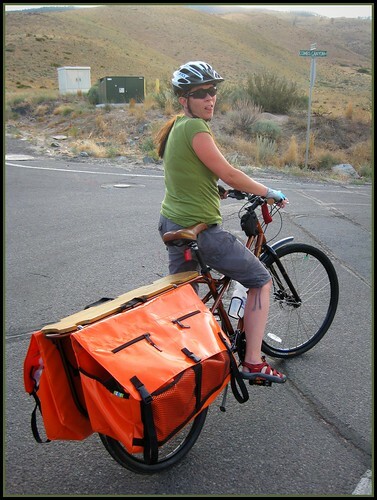 The tandem and trailer together were over 11 feet long! The dark cloudy skies were a little menacing looking, but the weather reports assured me the weather would clear as the night went on. We slowly pedaled to the northwest corner of town, en route to Combs Canyon. As we pedaled along College Parkway, I could see a lot of heads turning to look at our strange looking procession. A passenger in a car even snapped our photo at one of the stop lights. It felt good to cross highway 395 and get over to the less busy west side of town. When we got to the Silver Oaks golf course, we encountered a terrified baby duck stuck in the gutter. The rest of the duck family was nowhere to be seen, but we figured the duck had a better chance in the nearby bushes than it did on the road. Kristy lifted the poor little duck up over the curb, and we hoped for the best as we watched it run down the hill towards the bushes. 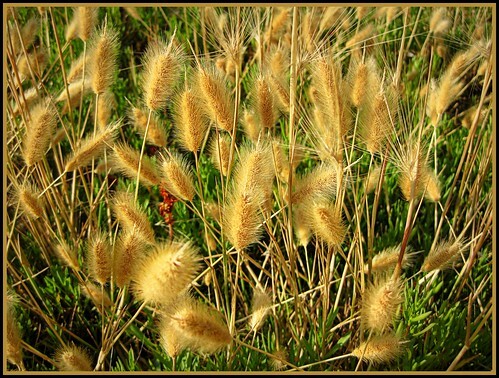 We continued our climb past the college, and saw numerous cottontail rabbits frolicking in the grass. The climbing was already pretty steep, but the biggest climb was yet to come. We rested at the bottom of Combs Canyon for a bit, and then began the slow journey up the road. Even in the granny gear, the fully loaded tandem took a lot of effort to get up the hill, jerking forward a few inches with each pedal stroke. Kristy was pushing hard too, carrying all the food, drinks, and cooking gear. A deer sighting and passing cyclists provided welcome distractions as we climbed along. We were very happy to finally reach the top of Combs Canyon, knowing that it would be mostly downhill all the way to the campground at Washoe Lake State Park. It was getting late in the day though, and we still had a few miles to go before the daylight ran out. We eased the bikes down the hill, and crossed under the underpass to East Lake Blvd. The home stretch! East Lake Blvd. is a fun cycling road, but it’s also narrow with no shoulder. You have no choice but to share the lane with cars, but not all of the drivers are eager to share. One car even honked at us for no good reason. Further down the road, Charlie and Kristy yelled, “Ewww!”, exclaiming that they saw a scorpion on the road. We circled back to check it out. As it turns out, it wasn’t a scorpion, but a big Jerusalem Cricket. Wanting to get it out of the middle of the road, and teach my son that we don’t have to be afraid of bugs, I picked it up with my gloved hand. The previously docile bug started wriggling madly between my fingers, turning its head to reveal some fairly respectful mandibles. I tried to quickly set it down on the side of the road, but it’s spiny legs were caught in the fabric of my gloves. I lost composure briefly and wildly shook my hand to get it off me! Charlie spat on the side of the road, just in case he got any bug matter in his mouth. 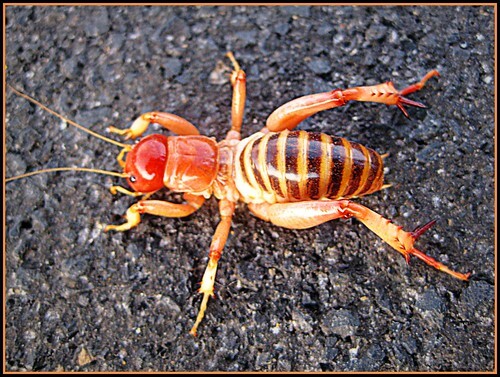 Later when I returned home, I found one site that had this to say about the Jerusalem Cricket, “They can be ferocious and cause a painful bite. So beware and use a long stick if you are inclined to observe them and their behavior.” I’m going to remember this for next time. We arrived at Washoe Lake State Park just in time. It was getting dark, and was time to get our bikes off the road. The first order of business was to get the tent setup, since it was getting a little chilly. After we had shelter, I started on dinner. We kept it simple by heating up some leftovers in a pan over my single burner backpacking stove. It’s one I’ve had since the 80’s, and it still works quite well. We weren’t very hungry when we left the house, but we now eagerly ate every last bit of dinner and enjoyed some well deserved beers. I started a fire with the Presto Log we brought along, but it offered nothing but a little light and ambiance. This 5 lb item is one I’ll be scratching off the list next time! 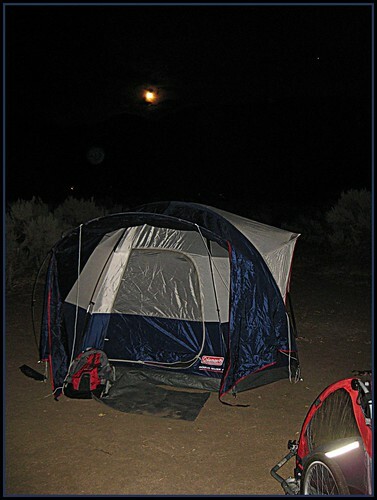 The nearly full moon came up after dinner, and really lit up the campsite. We read in the tent for a bit, played with our new iPhones, and then finally drifted off to sleep. Sometime during the night, I awoke to the mournful sound of many coyotes. Some near, and some miles away. Night music! The next morning we woke up to a peaceful high desert scene. The campground, lake, and mountains displayed in perfect color of the early morning light. Washoe Lake State Park really is an overlooked treasure close to home. We tend to forget it, because it is so close. The campground was only about half full, and all the campers were very quiet. 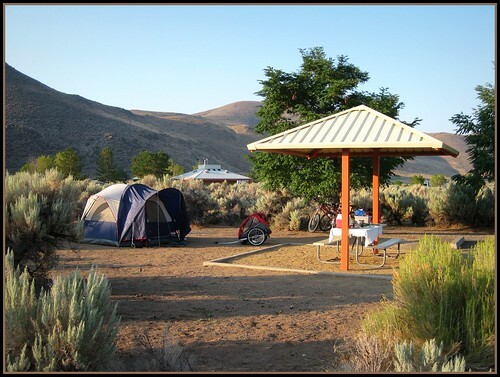 Each campsite is bordered by tall sagebrush, providing a good deal of privacy. The sandy ground is flat and perfect for pitching a tent, and each site includes a shade structure. Many sites even have shade trees. Clean bathrooms and showers were just a short walk from every site. Camp sites were $14 for the night. After eating a simple breakfast of fruit, bagels, cream cheese, and coffee, we went off for a hike down to the beach. 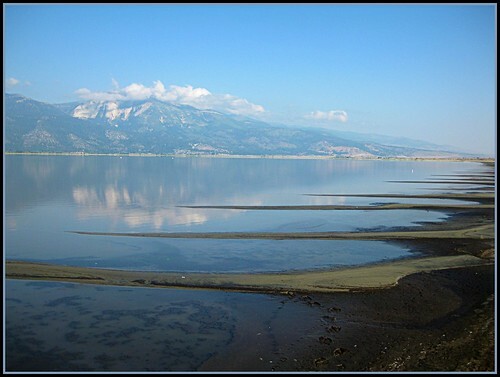 While the beach at Washoe Lake isn’t a great swimming beach like you might find at Lake Tahoe, it’s very interesting and fun to explore. There are sand dunes that run the length of the beach, and this is where Charlie spent most of his time. The lake has receded quite a bit, so there are different layers of ecosystems to walk through to get to the water. The high water mark had a nice sandy beach to sit on. Below that, there was a tall grassy strip of land. Between the grass and the new shoreline was a muddy section. Thousands of fish got trapped here as the water receded, and there were little dead fish everywhere. Surprisingly, there was very little odor. 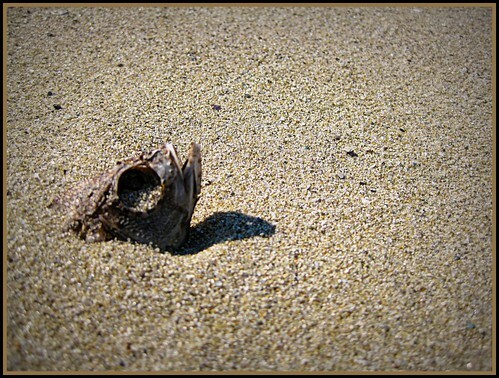 The birds must have had an all-you-can-eat buffet here before the fish decomposed! The actual shoreline had firm wet sand to walk on in many places. We all did our own thing for awhile. I ran around with my camera of course. There were many pelicans floating around the lake like little sail boats. They never let me get too close for a good picture unfortunately. Kristy was relaxing back on the high beach while Charlie jumped off the cliffs of the sand dunes. Finally, I spotted a coyote cruising the dunes, so we regrouped. We headed back to the campsite to get packed up for the journey home. It was still before noon, so we had plenty of time to get home at a leisurely pace. As we rode home along the lake, we ran into many road cyclists out for their Saturday morning ride. The cars were a lot more courteous in the morning than they were the night before, slowing down and giving us plenty of room. To all of our pleasures, there was far less climbing to get back over Lakeview on the way home; Washoe Lake sits up higher than Carson City. Once cresting the summit on top of Lakeview, we had miles of downhill and a slight tailwind all the way home. 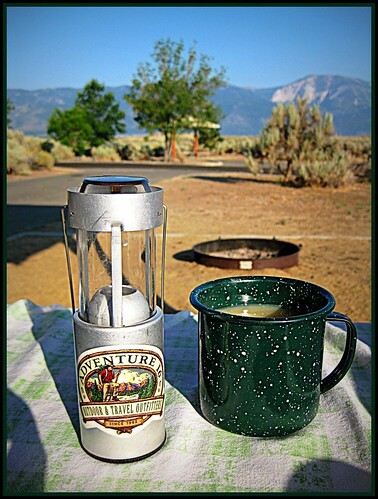 It turned out to be one of the best camping trips ever, and we can’t wait to do it again! Tent: We brought our roomy 4-person Coleman tent. The tent is rather heavy as it has several long poles. It’s not the ideal tent for bicycle camping, but we were lucky enough to have the room and our riding distance was not great. I’m already researching some lighter backpacking tents to purchase when I have some extra money. Sleeping Bags and Pads: Sleeping Bags were easily stowed in the trailer, but could have easily compressed and strapped down on racks. We each had a Thermarest inflatable pad to sleep on…minimal weight and volume. Food and Cooking Gear: We brought and easy dinner of leftovers, bagels and fruit for breakfast. A small ice chest fit easily on the back of the Ute. Cooking and eating gear included a small backpacking stove, backpacking cook pan, bowls, cups, and silverware. A small amount of dish soap and a cleaning sponge. A stove top coffee pot, coffee, cream, and sugar. Tea. And of course beer. Miscellaneous Gear: A small candle lantern, books, clip-on reading lights, books, pocket knife, bottle opener, phone, bicycle repair kit, extra fuel for the stove, matches and lighter in a waterproof container. Clothing and Personal Hygiene: Layered clothing. Wind breakers, fleece vests, wool socks, long pants, shorts, wool hats, sun hats, and underwear. We rode in our regular clothes…the short distance didn’t require any cycling specific clothing. We used flat pedals and wore our waterproof Keen sandals. No need to bring an extra pair of shoes. Tooth brushes, toothpaste, floss, TP, hair brush (for Kristy!). Water: Since there is plenty of good drinking water available at the campsite, we only carried water bottles on the bike. 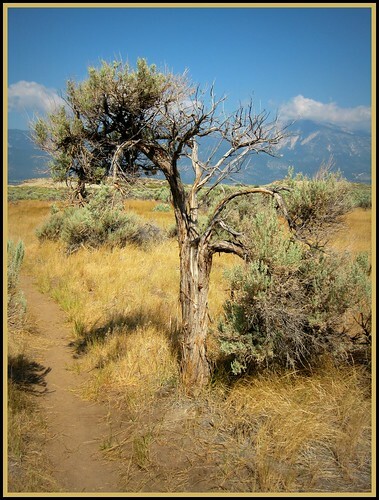 On the way home I was already thinking about where we could go next…although I wouldn’t be surprised if we ended up back at Washoe Lake State Park again. It’s so close and peaceful. Maybe you’d like to come along next time! The Juggernaut – Over 11 feet long! 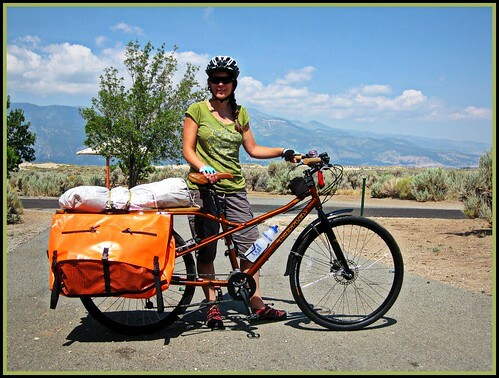 There is a nice description of bicycle touring vs. bicycle camping, and bicycle camping gear recommendations on the Rivendell Bicycle site. More photos from the camping trip can be found on Flickr HERE. The cricket incident is priceless, and I can picture it in my mind exactly as it probably happened. Thanks for sharing your adventure. Good fun! 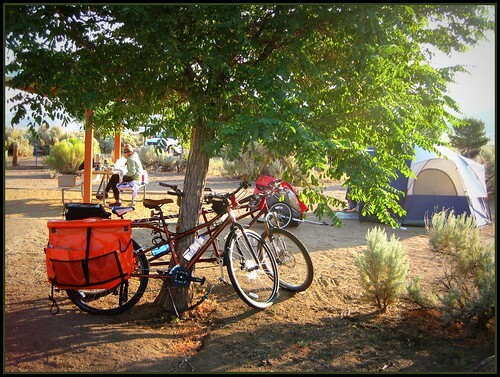 There is a nice little campground in Dayton along the river… could be a good one. Maybe 14 miles from home, tops. All those bottles lined up on the tandem make it look a bit like a scud missile launcher…. Another amazing source of motivation Moser! Thanks again. Awesome tale. Riveting. I especially enjoyed the part where you saved the woman you love by leaping from your moving tandem into the road to wrestle that poisonous cricket off of her and snap its neck with your bare hands. Bravo, sir! Looks like fun was had by all. Some good information in there for the rest of us yet to try such an excursion. Not sure if I can mount saddle bags on my Ridley though . . .
Jerusalem Cricket? We always called those potato bugs. That looks like my idea of camping. Going on the bike, staying one night, and returning on the bike. jeff, bring an old tire in lieu of the presto log next time. not much more weight, burns for ever and you can’t beat the ambiance. Define lost composure….. Did you scream? Ha ha. Loved the write up, sounds like alot of fun. Have you considered submitting this trip to the Adventure Cycling Association’s BikeOvernights.org website? I’m an intern at the organization right now and I know they’re looking for new overnight stories with great photos like those.